I'm leaving this up because it's what comes up in Google, but they're are last year's dates. If you go here, I made one with squares so you can write in the correct dates! Seriously, one of these months I'll get the calendar out before the month actually starts. Anyway, I hope you love December as much as I do. Where we're at, we've had at least 17" of snow already, and made a snow-woman out of it! 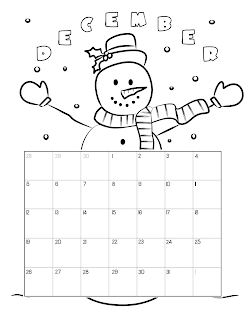 So, have lots of fun this month in the snow if you've got it! You can even color the snow with food coloring and water. How fun is that? You can also check out the Snowman books (Snowmen at Night, Snowmen at Christmas, and Snowmen All Year) by Caralyn and Mark Buehner. I love them, and my girls love them. So, there's lots to do this month. Anyway, bust out your crayons and enjoy! Happy December!